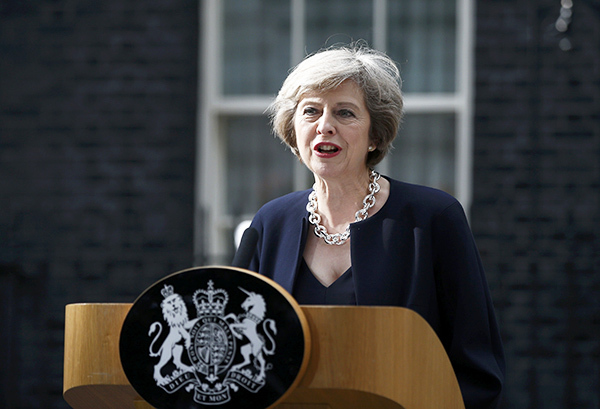 British Prime Minister Theresa May took office Wednesday, becoming the country's second woman leader after Margaret Thatcher. May was formally appointed by Queen Elizabeth after a meeting at Buckingham Palace. The new prime minister succeeded David Cameron, who stepped down after Britain voted to leave the European Union. May is already being compared to Thatcher, the iconic former leader known as the "Iron Lady." Thatcher, a Conservative, was Britain's longest-serving prime minister of the 20th century, holding office from 1979 to 1990. Besides being Britain's first female prime minister, she was also the first woman to lead a major Western democracy. One of the main comparisons between the two women is that May, 59, will be leading Britain through a historically important time. She will be in charge of overseeing the country's complex transition out of the EU. Before last month's referendum, also referred to as "Brexit," May campaigned with Cameron for Britain to stay in the EU. Since the vote, she has pledged to help the country "forge a new role for ourselves in the world." Britain's stock market and currency plunged after the Brexit vote and economists have predicted more challenges ahead. This week, the EU's economic affairs commissioner warned Britain's economic growth could drop 2.5 percent as a result of Brexit. Britain will also be faced with negotiating separate trade and political relationships with EU member nations. Cameron called May "a brilliant negotiator" Wednesday and urged her to maintain close ties with EU states. Earlier this week, May said her goal would be to "negotiate the best deal for Britain in leaving the EU." She said she would also aim to "make a success" of Brexit. It is clear that May will need to rely on her negotiating skills, as well as those of others, to lead Britain through the Brexit process. Thatcher was considered a tough negotiator from day one and she built on that reputation throughout her career. Thatcher maintained a firm stance on separatist movements in Northern Ireland. She also used strong language when addressing the Soviet Union and its nuclear expansion during the Cold War. Whether May will adopt this same approach to her public statements and negotiating style remains to be seen. On her first day in office, May appointed Boris Johnson, a leading supporter of Brexit, as the new foreign secretary. She is expected to appoint a special minister to guide the Brexit process and be a chief negotiator. Perhaps the most interesting parallels the two women share can be seen in a historical context. May faces Brexit uncertainties and a declining economy. Thatcher came into office at a time when Britain was going through political and economic turmoil. Labor disputes throughout the 1970s led to widespread strikes and high unemployment. There was public anger over high taxes, power shortages and trash in the streets. In 1976, economic conditions got so bad that Britain's currency collapsed and nearly led the country into bankruptcy. Thatcher was elected on a platform of fighting the recession and dealing strictly with labor organizations seen as causing unrest. May will also have to deal with the global problem of terrorism, which has directly hit Britain in the past. Thatcher faced persistent terror problems and was targeted herself in a bombing in 1984. Thatcher was not hurt in the attack, which was claimed by the Irish Republican Army. Just weeks before she took office, Thatcher's spokesman on Northern Ireland was killed in a car bombing as he drove out of a parking garage. The IRA claimed responsibility for that attack too. Both Thatcher and May started as cabinet ministers in Conservative governments before winning as prime minister. Thatcher served as education secretary under the government of Edward Heath. In her six years as Home Secretary, May has been in charge of the country's immigration, citizenship and national security. All of those areas were big issues during the campaigns of both sides during the Brexit debate. Hitler could not step down. The company continued him in office for another year. I aim to finish up this job. 1.May will also have to deal with the global problem of terrorism, which has directly hit Britain in the past. Anti-riot squads were called out to deal with the situation. 2.It is clear that May will need to rely on her negotiating skills, as well as those of others, to lead Britain through the Brexit process. They will more further rely on parents. I was sure that I might rely on you.